Five years after the Fukushima nuclear disaster, residents in communities near the crippled plant are coping with how their lives have changed. Wahei and Sadako Nagayama still keep the tiny Shinto shrine, former silk mill and zen garden in their yard as immaculate as ever. But these days, few people visit their 154-year-old home, which is now a stone's throw from a sprawling nuclear waste dump set up after the Fukushima disaster on Japan's northeast coast five years ago. "There are hundreds of homes, but only three households have come back" to the neighbourhood, says Wahei, who is 84. Services are limited and there's no grocery store, so they all have to rely on each other. "We always exchange food," adds 82-year-old Sadako. Their town of Naraha, 20 kilometres from the crippled Fukushima Daiichi nuclear plant, was under an evacuation order until September 2015. Decontamination workers have succeeded in lowering the radiation levels by collecting tainted topsoil and greenery. 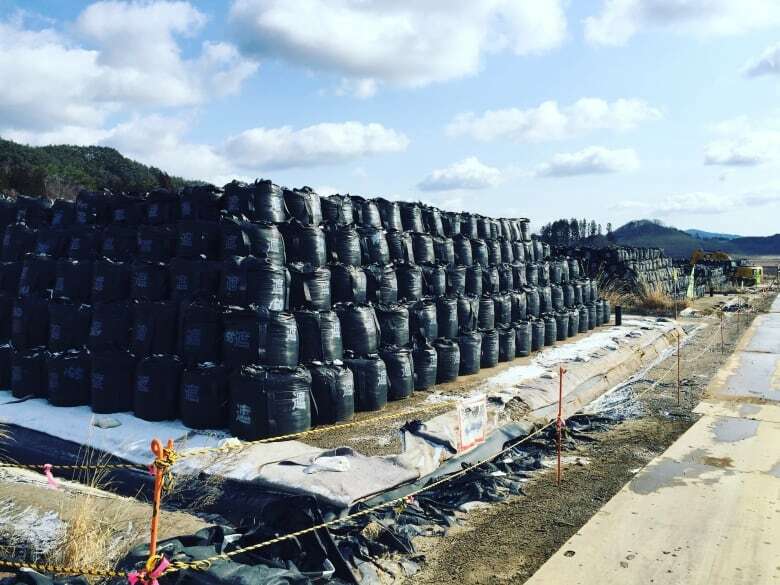 More than half a million bags of it sit in neatly organized rows along Naraha's coast. When the Nagayamas were told to leave on March 12, 2011, they thought it would only be for a few days. "I had no clue what was happening," Wahei says, "so I just brought my bank books and cash." A day earlier, the region was rocked by a magnitude 9.0 earthquake powerful enough to shift the Earth's axis. The tsunami that followed, as high as 40 metres in some areas, crashed through seawalls and washed away entire towns, leaving 19,000 people dead or missing. The Nagayamas were far enough inland to be spared, but the waves inundated the nuclear plant, causing hydrogen explosions that blanketed their town in radioactive particles. They spent the next four years in temporary housing, and while their lives are forever changed, they are still happy to be home. 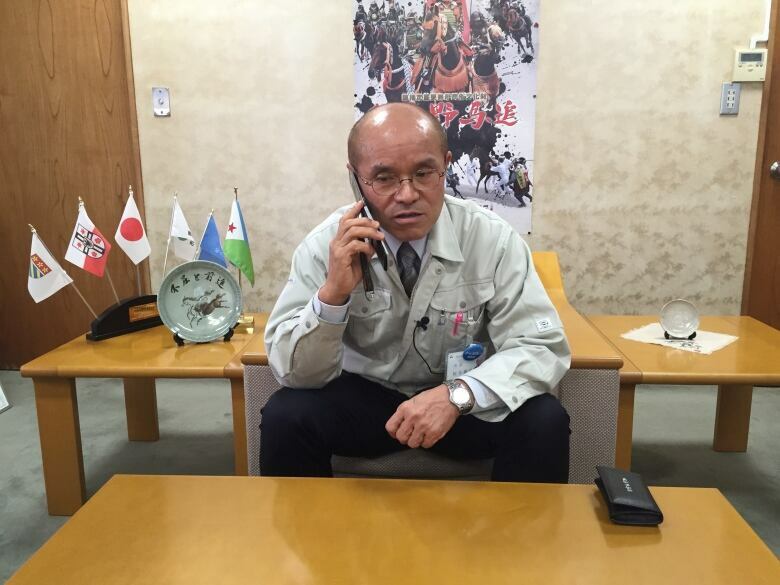 Wahei checks radiation levels daily around his property on a hand-held dosimeter. The neighbourhood is quiet, save for the construction vehicles that rumble by. "It's spring, so I can do yard work as exercise. I don't have time to feel lonely," Wahei says. "And we have each other as company." Many of the people who were forced to leave the town settled in the city of Iwaki, 60 kilometres south of the plant. It escaped the worst of the nuclear fallout but not damage from the tsunami and quake. In the case of the Niitsuma family, their 250-year-old farmhouse was nearly shaken off its foundation. Part of the house is still filled with broken furniture. "We don't use this room anymore because it's too dangerous," says 37-year-old Tadaaki Niitsuma, pointing to a gaping crack in the wall. The house is leaning so much that no doors close completely. And the traditional thatch roof, covered by rusting metal sheets, now leaks in the rain. They never had costly earthquake insurance but even if they did, there is a long waiting list for architects and construction workers. Niitsuma was working at a Vancouver Tim Hortons when the disaster struck and raced home to help his aging parents, Akio and Sachie. They took a financial hit because they couldn't sell their rice and vegetables. No one wanted Fukushima food because of radiation fears. Niitsuma now works four jobs to help make ends meet and in November, he turned to an online service to rent out rooms in their home. "We want people to know an authentic Japanese folk house," Tadaaki says. "Accepting strangers was scary at first," Sachie says with a laugh, "but after staying they become a member of the family." Twenty-five kilometres north of the nuclear plant, Katsunobu Sakurai looks out his office window and over his redeveloping city. As mayor of the town of Minamisoma, the new normal for him is a life centred on the region's reconstruction and decontamination work. It's been a long road. Five years ago, he sat in the same office looking absolutely spent. Part of his city that hugged the coast was washed away by the tsunami and low levels of radiation permeated the town. In front of a video camera, he pleaded for food and medical supplies, which were running dangerously low. And he called out the Japanese government and plant operator, Tokyo Electric Power Company, for failing to inform people about what was happening. He posted the video to YouTube and received worldwide attention. More than 60,000 people fled from the city, scared of the invisible threat of radiation. Sakurai was one of the 9,000 who stayed behind. "We're still returning from hell," he says today. The decontamination work continues. Topsoil has been bagged up here, too, half a million tonnes so far. Of the 23,000 houses in Minamisoma, half have been decontaminated. Drive through the city on any given day and you can see multiple teams of four or five workers in coveralls and masks working around different properties. There is progress, though. Stores are open, people go about their daily routines and the population has rebounded to around 57,000. But Sakurai says there's still a reason to be worried — younger families have not come back. "This is also the generation that has children. Many have left for good," he said. Sakurai says his goal is to get people to return by convincing them that the food and air is safe. It's not exactly what you would call a normal task for a city's mayor. But normal left this region five years ago. And today, whether you're Sakurai, the Niitsumas or the Nagayamas, it's a word that has a new meaning. Not just for them, but for the whole country.